A journey undertaken for many reasons - to see more of the "true" Spain, an interest in the peninsular war, searching for new wines - relaxation didn't really come into it! 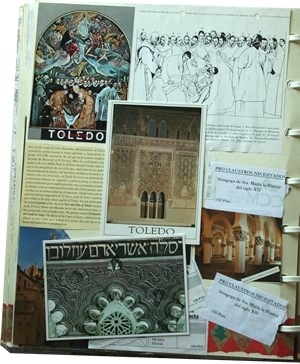 Our overly ambitious initial plans coallesced into an itinerary covering the cities and surroundings of Toledo, Salamanca, Haro and Segovia. 5.45am up and running - we stayed overnight at the Post House Hotel at Manchester Airport where we left our car for the duration. Checked in Terminal One 7.15am, excellent BA breakfast OJ, cornflakes, ham croissant, fruit, muffin and coffee. Madrid 12.55pm. Avis to collect our car - a Vauxhall Nova/Opel Corsa, with no sign that it's a hire car which seems to be the norm now and a good idea for tourists. 27°C - excellent, just how I like it! Arrived at the Hotel Domenico just outside Toledo at 3pm. It's a lovely hotel, our room is large, comfortable and has a balcony with a fine view of the city. A beer in the hotel bar and a relaxing afternoon despite internal urgings to go and see something! We enjoyed a very good dinner in the hotel restaurant - prawns followed by Toledo-style partridge for me, steak and chips for Andrew - we learned from our waitress that the steak is called a solomillo. Neither of us speak much Spanish - despite the tapes that have lain around the house for the past six months. One did actually make it into the car in an attempt to learn something while travelling to and from work but we didn't get past the first side! In any case, the waitress appreciated our abysmal attempts and tried to help us learn more. One excellent wine discovery - a Manchegan Senorio de Guadianeja Cencibel. The following day straight to the Hospital de Santa Cruz museum to give El Greco a chance. The building is fine "plata" means "silver" in Spanish. El Greco is not an artist I've ever really liked, and I'm still not keen. But we like the huge pennants from the Battle of Lepanto, in which the Turkish fleet was defeated and Spain became supreme master of the Mediterranean. The museum was extremely hot so we escaped and wandered around the city - also very hot. 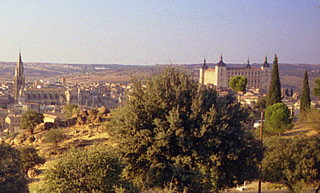 Toledo dates from a Roman settlement when the original fortress was built, though this has been extensively rebuilt and attained its classic square shape with a turret at each corner in the sixteenth century. The Mudéjar architecture is lovely - this is the Islamic style developed under Christian rule, so with strong Arabic influence. Sinagoga del Transito and Sinagoga de Santa Maria la Blanca with its wonderful white horseshoe arches are beautiful. The Gothic cathedral is not to my taste, though I believe there are some very nice carved medieval misericords which we did not see. The suspended cardinal's hat is fun. Traditionally a cardinal buried in the cathedral has his hat suspended above his tomb. Andrew's highlight - Häagen-Dazs ice cream. 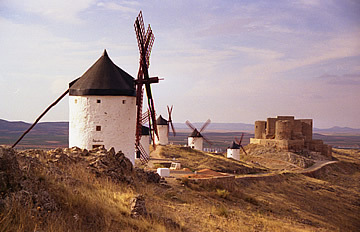 A long lunch at the hotel and a short siesta before driving out to the windmills at Consuegra. It was wonderfully cool on the ridge and we stayed there for a couple of hours at least - for both of us this was a highlight. It was wine harvest and the roads were full of carts taking the grapes to the co-operatives. Another great hotel meal - we really don't need to go out - steak for me "deer shoot with apple mashed" for Andrew, sorbets and (free) lemony grappa-type local liqueurs with coffee. 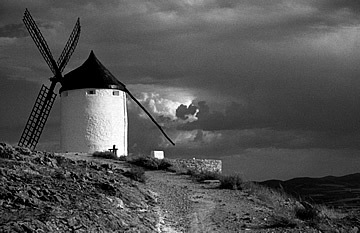 The following day to Talavera - our first battlefield. 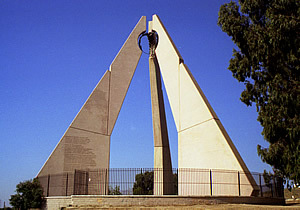 It was difficult to find from the town, even though there is a huge monument there. Over 30°C today! Later in the day we venture back into Toledo and to see El Greco's "The Burial of the Count Orgaz" and I finally get it! Painted for the Iglesia de Santo Tomé in the late 1580s it is a stunning painting. More Häagen-Dazs - Malibu, a new one to us and very good. A tiring day of touring. 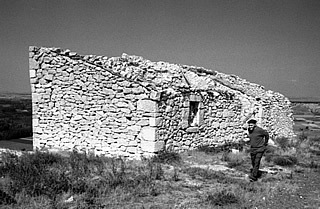 We tried to visit the Puella Bodegas which we found after a tortuous route through the village but no signs of life except a dog. Thankfully regaining the road we drove to the hilltop town of Laguaria - very attractive setting but I found the very narrow streets and high walls claustrophobic. We drove on down the N111 to Viguera for magnificent views back up the steep-sided valley. After a roadside lunch we went on to Enciso to see the famous dinosaur footprints. We were so tired by this point that we couldn't walk to what might be more impressive manifestations - the ones we saw were not particularly inspiring. 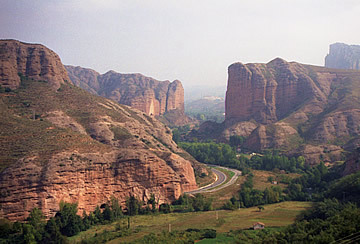 The drive was picturesque, though - another deep valley in fantastic cliffs which have caves with windows and doors set into them. The rock was deepest pink, almost red, as the sun went down. After yesterday we decided not to do too much so drove first up to the Balcon de la Rioja but it was too hazy for good views - it's probably better in winter on a colder, clearer day. 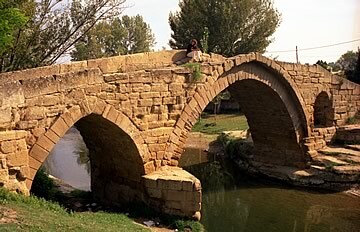 We eventually had a picnic lunch at the Roman bridge at Churi, a very beautiful double arch, one over the river the other over a tow path. 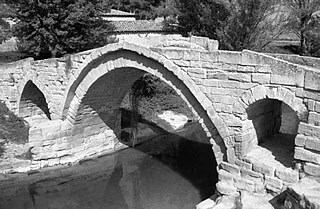 On the opposite side to the tow path the bridge is pierced by an arched passage. Our final visit for the day was to Sajazarra, primarily for the castle but we discovered that the village itself is very nice and we strolled around for a while. 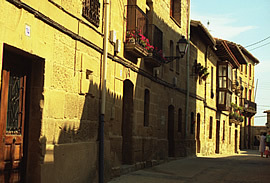 In one area near the river there is a "street" of small houses - cut into the rock face on one side. Families were roasting huge quantities of red peppers on braziers outside. Our evening meal in Haro was at Beethoven II - excellent gambas a la plancha and cordero asado with a fine Rioja Reserva from Haro's Bodegas Bilbao. 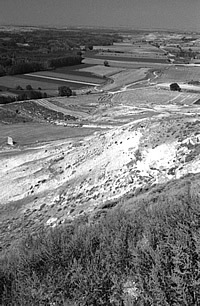 On the outskirts of Haza. 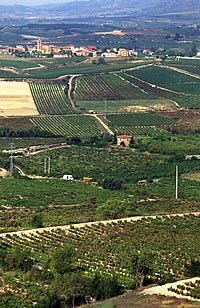 We drove to Segovia via the Ribera valley, buying Ribera along the way and having a picnic-lunch in the hilltop town of Haza with tremendous views over the surrounding countryside. This is very much wine country. The village was almost deserted apart from building workers - there was a lot of building being done - and a garrulous old man who was very proud of his village. 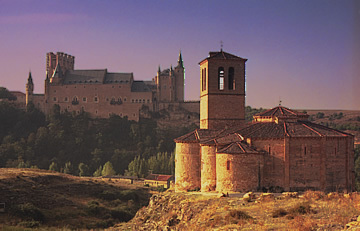 Segovia is a beautiful and ancient city. 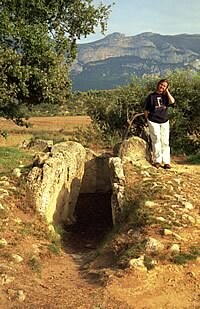 It was an important Roman military town and later, in medieval times under Moorish rule, a wool and industrial centre. 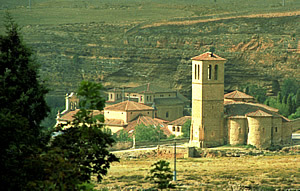 The city is famous for its Romanesque churches. 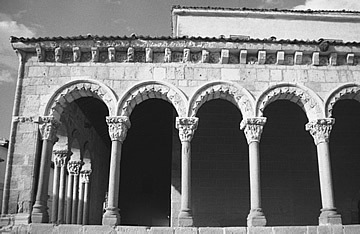 Twelfth century San Andrés is a beautful example of plain Romanesque while the thirteenth century St Esteban is more decorative and one of the loveliest. Sadly the carved capitals of the columned arcade are rather worn and the tower had to be rebuilt after a fire in the nineteenth century. 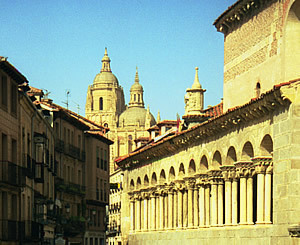 with the Cathedral in the background. 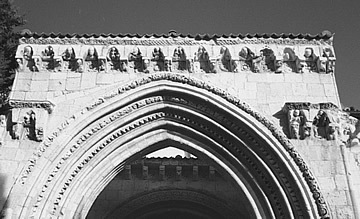 A Gothic arch fronts an earlier Romanesque arch. 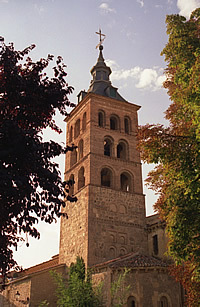 San Juan de los Caballeros is possibly the oldest church in Segovia, dating from the eleventh century. 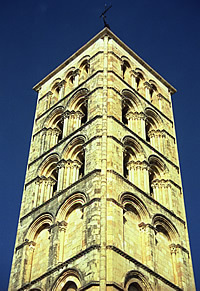 A mixture of Romanesque and later Gothic architecture its carving is mostly badly worn except where sheltered from the weather. 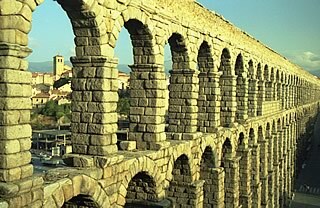 The very well-preserved Roman aqueduct is magnificent, one of the finest remaining. 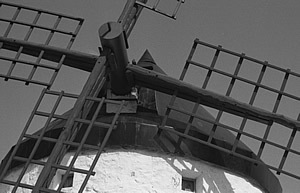 It was built in the first century A.D. and is still in operation today. 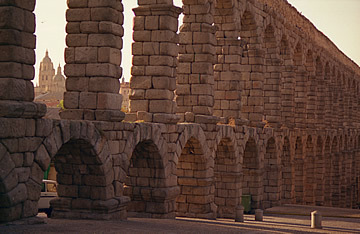 It is 728m long and 28m high at its highest point, being composed of a double tier of arches throughout its length. We had a three roomed "suite" in the Hotel Los Linajes with a balcony with a superb view over the surrounding countryside. The restaurant Jose Maria served marvellous suckling pig and lamb, and an astonishingly good Rueda Sauvignon Blanc - this as an aperitif courtesy of the restaurant - we had Ribera with the meal. The wines are really excellent in this region. 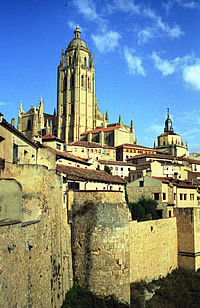 The cathedral tower rises high above the city walls. 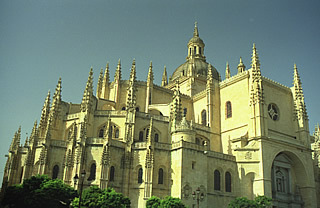 Segovia is a lovely city to stroll around with lots of beautiful buildings. 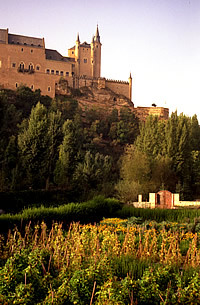 Two of the most important are the imposing Alcazar, built in the thirteenth century but later modified, and the sixteenth century gothic style cathedral. 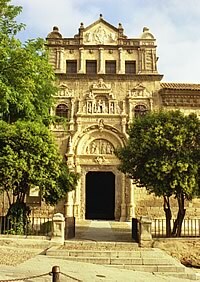 Outside the city is the beautiful Iglesia de la Vera Cruz - the Church of the True Cross. 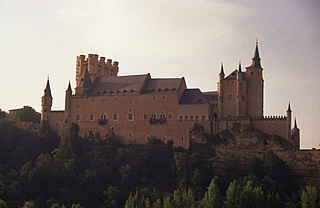 It is thirteenth century Romanesque built by the Knights Templar to house a fragment of the cross on which Christ was crucified. 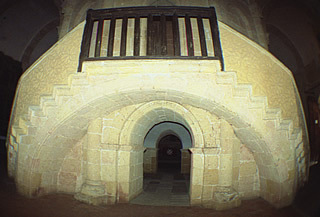 Central double staircase in Iglesia de la Vera Cruz (distorted due to wide angle lens). 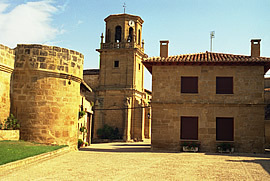 The main building has twelve sides with a tower on the south side. 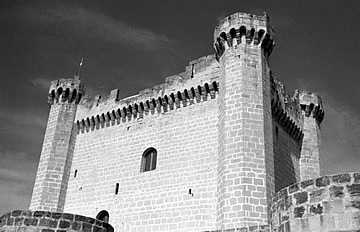 Inside a double staircase around a central tower leads to an upper storey from where, it is said, the knights kept watch over the relic. This is a most beautiful church, my favourite here, and one of my all-time favourites anywhere. 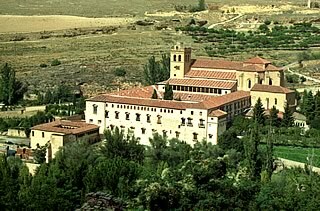 We could see Iglesia de la Vera Cruz from our hotel room balcony - we could also see into the cloisters of the fifteenth century Monasterio de Santa Maria del Parral and were intrigued by an exercise bike which, unfortunately, we never saw in use. We discovered Manchegan cheese which is strong and nutty. More meat at the Restaurant Mescon Mayor, suckling pig and lamb, with an excellent Ribera del Duero. Our final full day and it was very hot. We decided we had better go to El Escorial but wish we hadn't - it is vast, cavernous and the most interesting part was the wonderful wooden acting going on for some film unit in the courtyard. That's probably a bit unfair as the tombs are rather magnificent and, although the basilica was very dark, the family sculpture groups are well worth seeing. Unfortunately, one room we would have been very interested in - the Gallery of Battles - was closed. 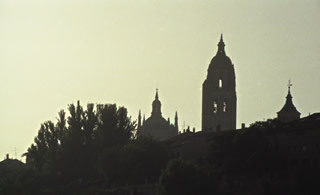 We had great difficulty in finding our way back to the road to Haro - we had wanted to get to a viewpoint to see El Escorial from a distance but two attempts at the traffic and one-way system defeated us - but eventually we were once more sitting on our cool balcony enjoying a rather late lunch. A lazy afternoon followed by a final meal at the Mescon Mayor - although we wish we had another evening to revisit the Jose Maria too!